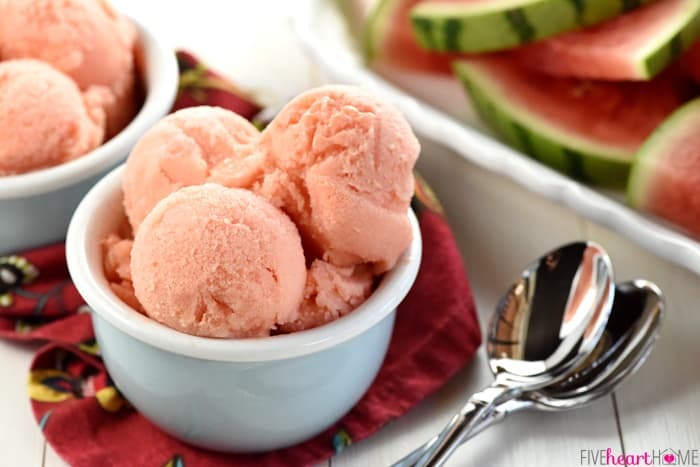 2-Ingredient Watermelon Sherbet is a light, refreshing frozen treat that comes together with just fruit and yogurt for a healthy summer snack or dessert! Please pardon all of the frozen treats around here lately…it’s just too hot to anything, y’all. 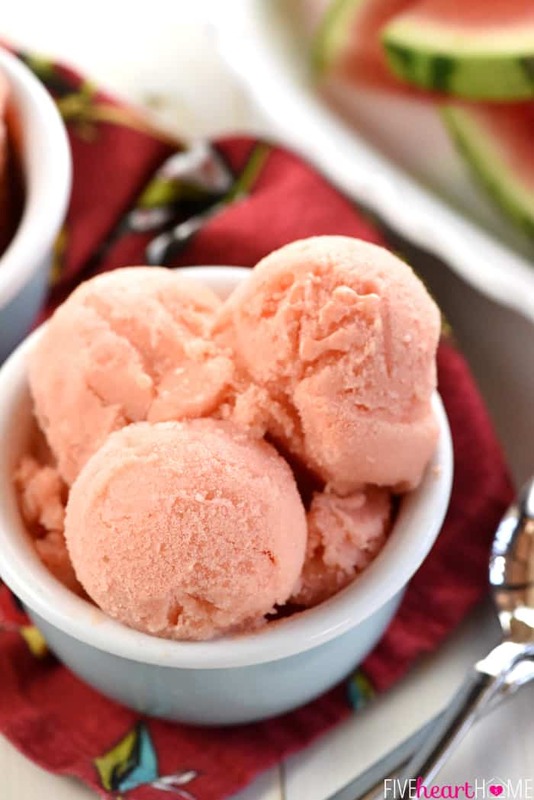 I actually wasn’t even going to share this Watermelon Sherbet recipe, but it was so easy to make (only two ingredients!) and turned out so tasty that I thought y’all might be as excited about it as I was. My kids are enamored with it for sure. Because it’s basically like watermelon ice cream that they don’t even realize is good for them. Watermelon + yogurt…that’s all, folks! You know that “ice cream” that you can make by pureeing frozen bananas in the food processor to a smooth and creamy consistency? Well, that’s essentially what you do here as well. Cut seedless watermelon into small cubes and freeze. Then blend ’em up in the food processor with a big dollop of vanilla yogurt and wait for frozen treat magic to materialize right before your eyes. 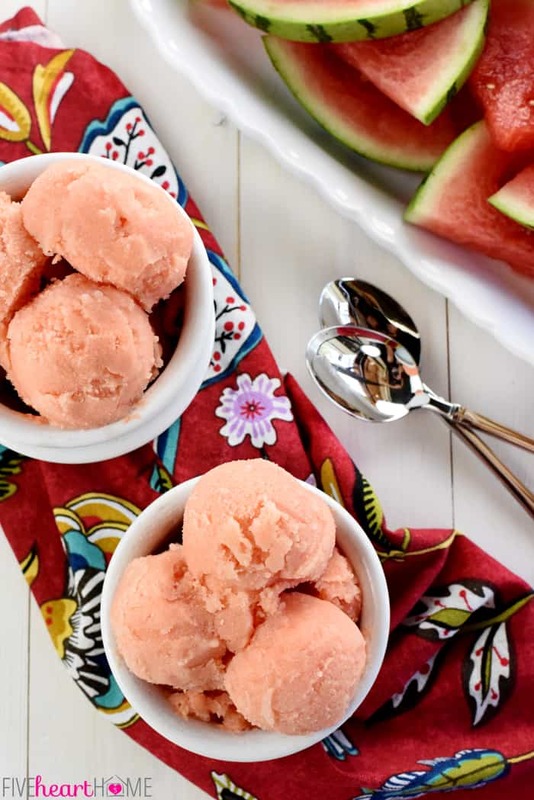 This 2-Ingredient Watermelon Sherbet is fantastic if you eat it right after it’s made, with a creamy texture akin to frozen yogurt or soft-serve ice cream. If you prefer a firmer texture, you can transfer it to a shallow container and freeze for a couple of hours until it’s scoopable. 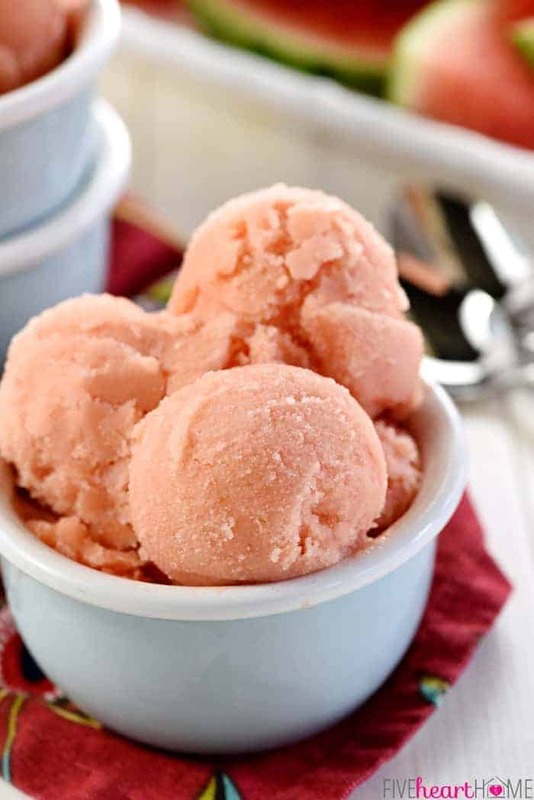 If you freeze it for too long, however, be forewarned that your sherbet will harden into a solid mass that will chip off like a granita as opposed to scoop like an ice cream. 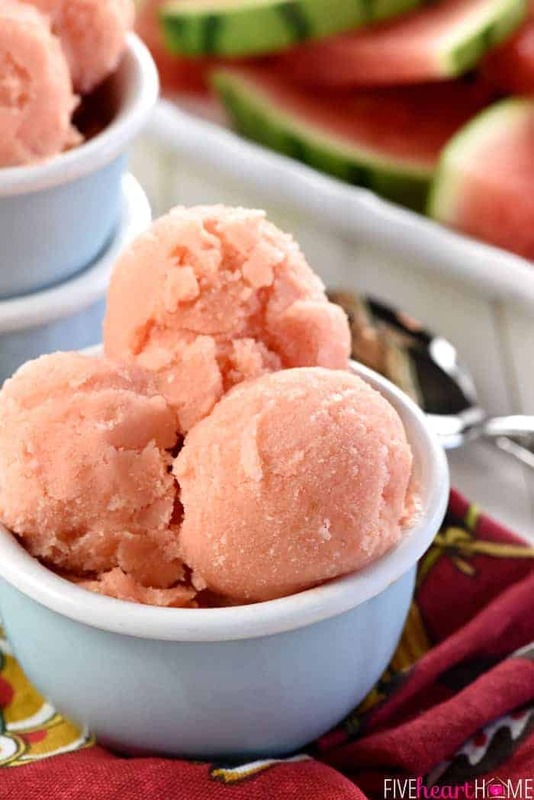 In experimenting to create this recipe, one thing I learned is that if you put too many frozen watermelon cubes in the food processor at the same time, they might not all churn up. So to make a full recipe (calling for 3 cups of cubed watermelon and 1/2 cup yogurt…spoiler alert! ), I actually only put half the watermelon into the food processor to begin with. I processed it until grainy, added half of the yogurt, and then processed until smooth and creamy. Then I scraped the sherbet into a container before repeating with the remaining other half of the ingredients. 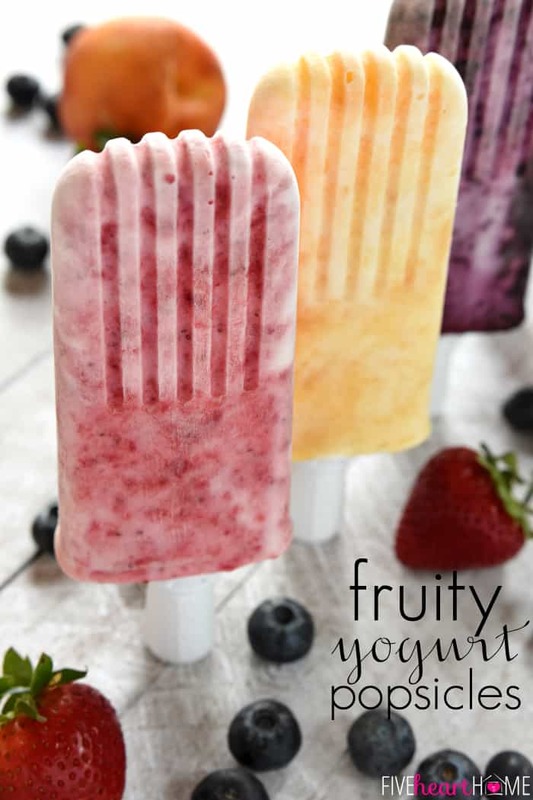 I chose to add yogurt to my frozen watermelon delight to add just a touch of creaminess to the final product. I picked vanilla instead of plain yogurt so as not to put a damper on the natural sweetness of my watermelon. 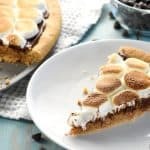 That being said, you can try making this recipe with plain yogurt instead, but you might find that you need to add a couple spoonfuls of sugar or a squeeze of honey to compensate. And if you use honey, I might recommend adding a squeeze of lime at the same time…doesn’t that sound good? 😉 I also think that using regular yogurt as opposed to Greek yogurt is probably preferable, because the thinner regular yogurt helps loosen up the watermelon enough to puree it to a smooth consistency more easily. But I honestly haven’t tried this recipe with Greek yogurt, so if you want to give it a try, let me know how it turns out! 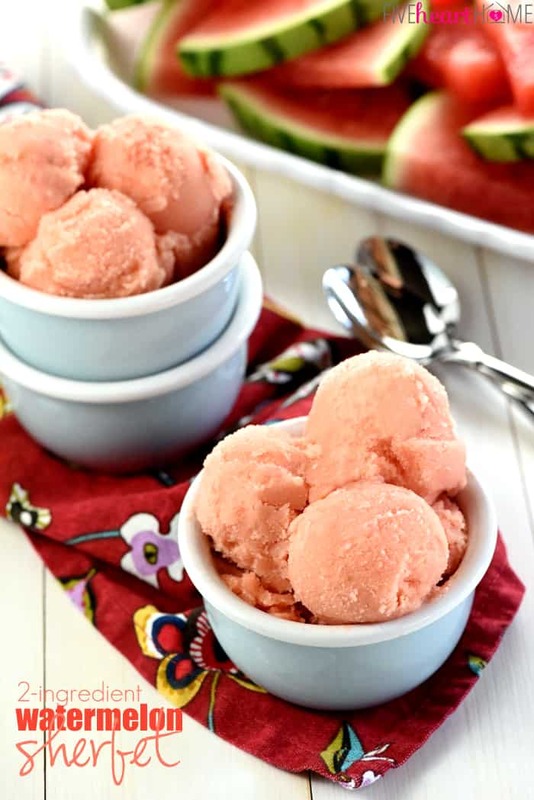 2-Ingredient Watermelon Sherbet is a light, refreshing frozen treat that comes together with just fruit and yogurt, the perfect healthy snack or dessert for cooling down all summer long! 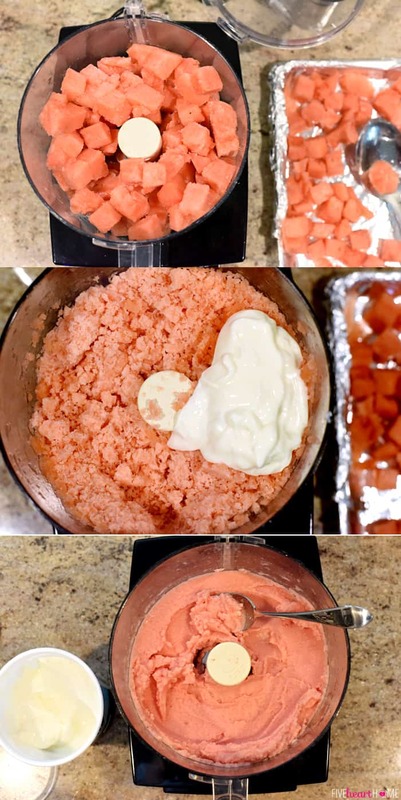 Add half of the frozen watermelon cubes to a large food processor. Process until the watermelon breaks down and becomes grainy. Stop the food processor and add half of the yogurt. 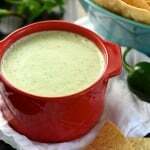 Process until the mixture becomes smooth and creamy, scraping down the sides of the bowl as necessary. Scoop the sherbet into a separate container and repeat steps with the remaining ingredients. Serve immediately for a frozen yogurt/soft-serve consistency. 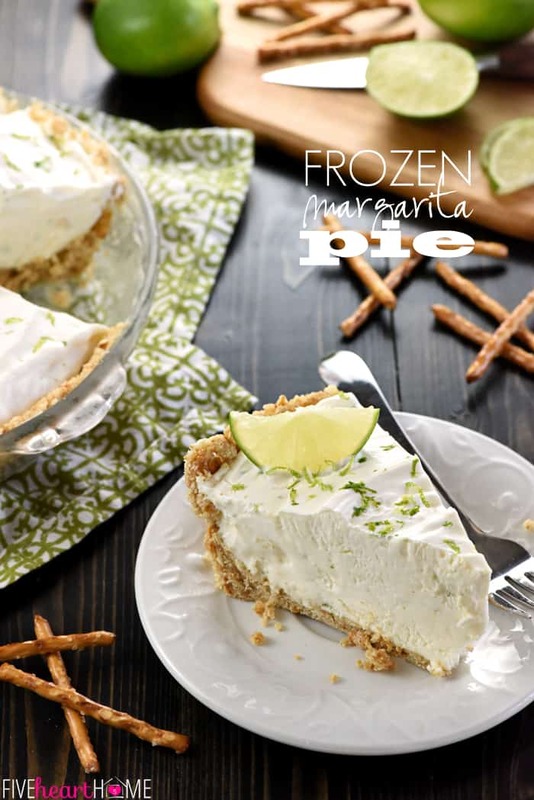 For a firmer consistency, freeze for 1 to 2 hours and then scoop. Leftovers may be frozen solid, but the sherbet will be very hard and impossible to scoop straight out of the freezer. Instead, place the container of frozen sherbet in the refrigerator to slowly soften for 3 hours before serving, at which point it should be scoopable. A small (personal-sized) seedless watermelon will yield around 7 cups of watermelon cubes, enough for at least two batches of this recipe. I try to remove as many small seeds as possible while cutting my watermelon into cubes so that the seeds don't end up in the sherbet. 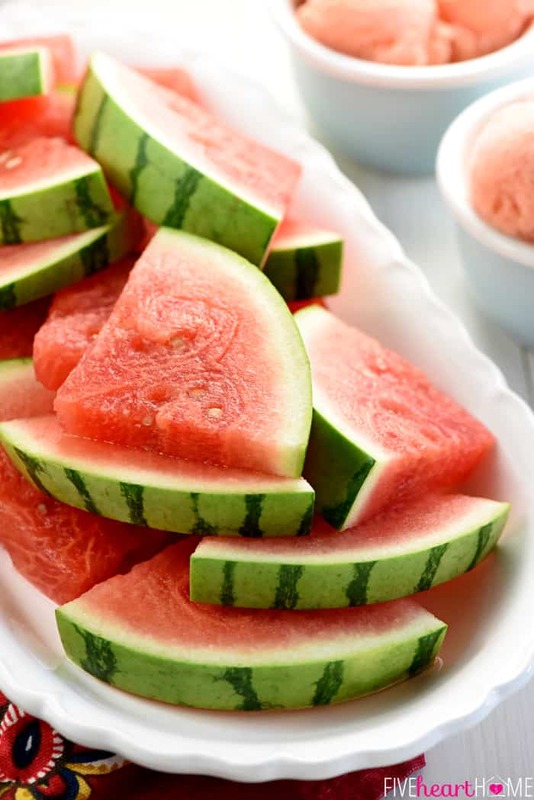 To freeze the watermelon cubes, place them in a single layer on a rimmed baking sheet and place in the freezer for at least 4 hours but preferably overnight. Make sure there's not excess watermelon juice on the pan or the cubes will freeze into a solid mass. I also prefer freezing the cubes on top of a piece of foil or parchment paper which makes it easier to release them from the pan later. When making this sherbet, be sure to work quickly or the watermelon will start to thaw and the sherbet may become watery. You can never have too many frozen treats!! 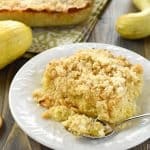 I love this simple recipe. I have to get a watermelon before Summer’s over!!! Do you mean sorbet? Sherbert is a powder! Hi Lucy! I meant sherbet. 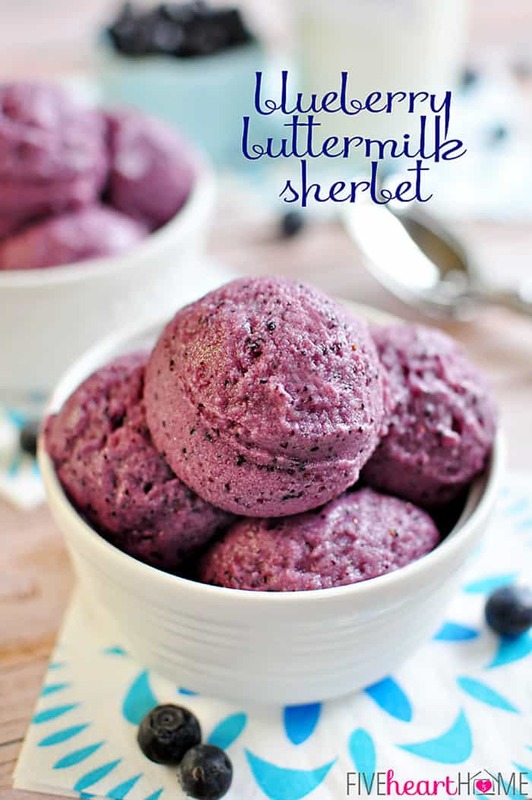 🙂 In America, sherbet is a frozen fruit dessert that contains some sort of dairy (in this recipe, the yogurt). Sherbet is lighter than ice cream but still creamy. Sorbet is a frozen fruit based dessert containing no dairy. 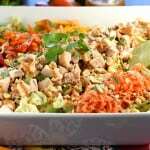 Thanks for sharing this yummy and healthy recipe idea! Ever since I had Watermelon Soft Serve Ice Cream at Dominique Ansel Bakery in London. I’ve been obsessed with Watermelon Ice Cream and Sorbets. I’m going to have a crack at this recipe over the next few days. I can’t wait to try this!! I found your blog by accident, trying to find a way to salvage a bag of frozen cubes of watermelon, that I pureed for my 6 month old baby boy! After I thawed them, I found that they turned to almost pure liquid.So, I was looking up things I could mix with watermelon, and found your blog, I’m so excited! Hopefully it works since my watermelon was pureed, then froze into cubes. 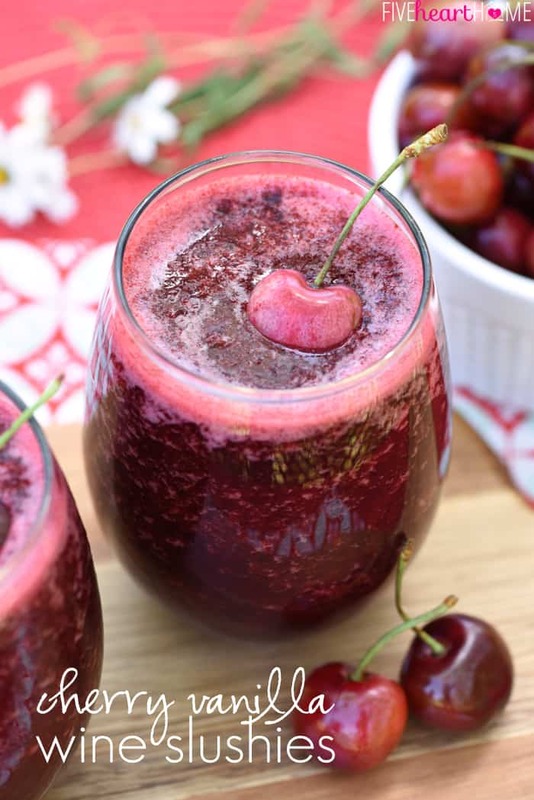 I’ve started taking pictures of some of my pureed foods I’ve made and, posting them on Instagram and, Twitter! I actually made him watermelon oatmeal this mourning! He loved it! If you have a hash tag let me know,and I’ll tag you after I try to make this! Wish me luck! I’ll definitely check to see if you have a Instagram, if so I’ll find You! My Instagram name is chevesleswin, hope to talk to you soon! Hope this was a hit with your baby boy, Yvonne!